1. What happens at a Paint Party? Bread of Life/The Art Project, Houston (TAPH) Presentation, which includes one or two stories of the difference the project is making in the lives of TAPH artists/participants. 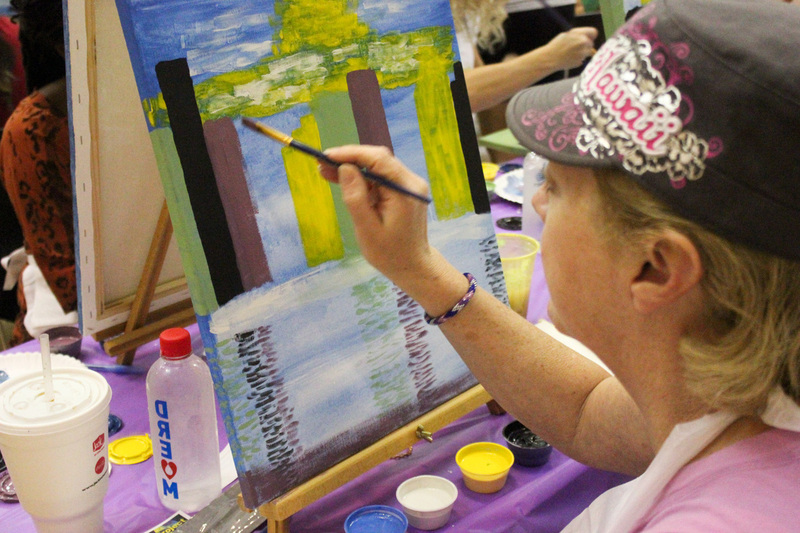 Interactive FUN painting experience, where participants are led in creating and completing their very own masterpiece they can take home with them. We bring music and participants are invited to fellowship as they paint. TAPH art and merchandise will be exhibited and available for purchase. Participants can take home original art from TAPH ranging from $5 to $300. Cash, check or charge. A time for participants to learn of ways they can continue to support The Art Project, Houston and the ongoing work of the Bread of Life to provide solutions to homelessness and hunger in the City of Houston. 2. What is the suggested donation for a Paint Party with TAPH? Can Paint Party guests also donate art supplies? Suggested donation for a Paint Party with TAPH is $50 per guest, minimum suggested donation being $500 for a party. In addition to the suggested financial donations, you are welcome to invite your guests to bring new and used art supplies. Click here to view our Art Supply Wish List. 3. What do the donation contributions support? To learn more about our story and the difference our donors make through their generous support, click here. 4. Who makes up the Paint Party Team? 5. What space is needed in order to host a Paint Party for 10 to 150 Paint Party guests? paint party participants, a supply table, display table and standing easel for the Paint Party Instructor. If you do not have a space to host the party, we do have spaces available to accommodate your party needs. 6. What is the set-up for a Paint Party? disposable, but it is most ideal for the host to be able to provide tables. of water, paper towel, hand wipes and plates) for each guest. 7. What are the host/hostesses responsibilities? Provide a count of Paint Party participants at least 3-days prior to the part and communicate with the Paint Party Coordinator to ensure all needs/concerns are addressed before party time. Collect donations and turn into TAPH Paint Party Coordinator (Cash, check or charge). 8. Do you do parties for children and youth? experiences we can provide for a children or youth paint party experiences, depending on the age and size of the group. Parties for children and youth range from a a suggested donation of $15-30 per person, depending upon the experience and group size. 9. Can you suggest a painting not in the gallery? 10. What days and times are available for Paint Parties? Available days for Paint Parties are Sunday, Tuesday, Wednesday, Thursday and Saturdays. Your party can be schedule morning, noon or evening on any of those 5 days. If you would like to schedule party on a Monday or Friday for a special event, contact our office and we will work with you if possible. If you have a question that is not answered above, please email it to us and we will get back to you within the 24-hours. Thanks for taking the time to learn more supporting us by hosting a Paint Party with TAPH!